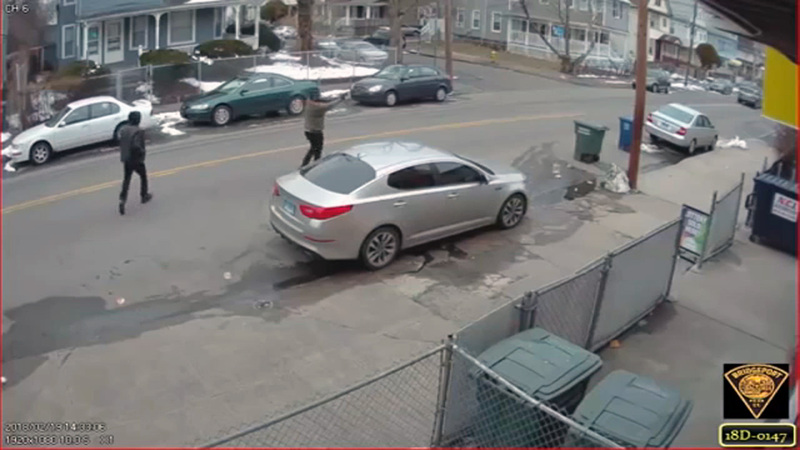 BRIDGEPORT, Connecticut (WABC) -- Police in Connecticut are searching for two suspects responsible for a shooting that left an uninvolved utility worker injured, and they're hoping surveillance video will lead to arrests. The incident happened around 2:30 p.m. Monday in the area of Wood Avenue in Bridgeport. The video shows the suspect walking with another man before firing a gun in the middle of the street, near the corner of Wood Avenue and Laurel Place. The other man then runs to his car following the shots, while the shooter runs off. According to police, a cable company worker was struck in the leg. Anyone with information is urged to contact Bridgeport police at 203-581-5241 or CrimeStoppers at 203-576-TIPS.